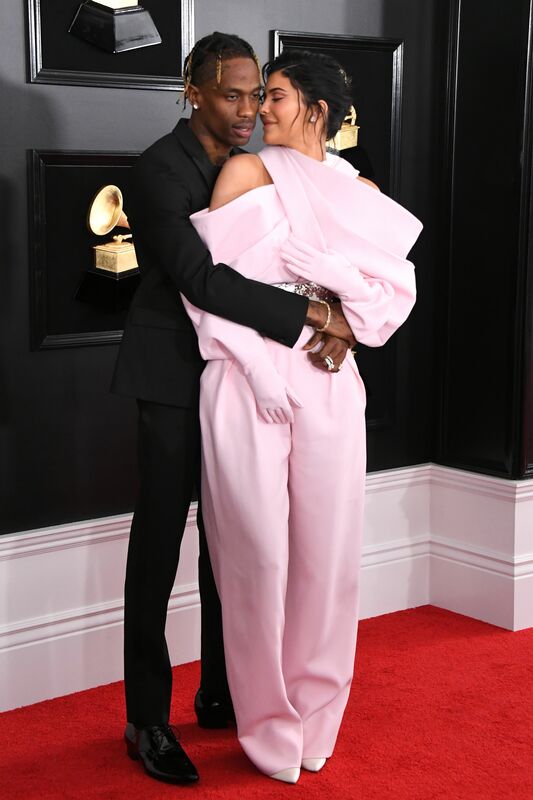 Kylie Jenner just made her Grammys debut tonight with boyfriend Travis Scott, and she didn’t hold back on her look. The almost-billionaire beauty mogul appeared on the red carpet wearing a sculptural pink jumpsuit with attached gloves and a silver-and-white belt. Jenner, 21, kicked off the weekend on a glamorous note with a dramatic red Ralph & Russo gown, which she wore to the Pre-Grammy Gala last night. The elegant yet fiery look featured a strapless neckline, ruffled detailing at the waist, and a seductive thigh-high slit. The cosmetics queen went classic for her beauty look, opting for a bright red lip and voluminous raven waves. Scott is nominated for three awards tonight, with “Sicko Mode” up for Best Rap Song and his LP Astrowold up for Best Rap Album. “Sicko Mode” was also in the running for Best Rap Performance, but lost to a tie: “King’s Dead” by Jay Rock feat. Kendrick Lamar, Jay Rock, Future and James Blake and “Bubblin'” by Anderson .Paak. Whether Scott wins big tonight or not, he and Jenner are celebrating regardless, because their daughter, Stormi Webster, recently rang in her first birthday with a lavish amusement park-themed party. And last weekend, Scott performed at Super Bowl LIII alongside Maroon 5 and Big Boi. Jenner and Stormi, of course, cheered him on from backstage.